This is my first official posting for #SundaySupper and I’m super nervous and excited to be here. Considering the fact that I’m a wet-behind-the-ears newbie with the #SundaySupper crowd, I’m a bit worried that I’ll mess up on some of the important links and mentions that I need to include in my post. That said, I’ll plow ahead and do my best! This particular #SundaySupper event (hosted by Tammi of Mama’s Meals) was “celebrity chef” week. Everyone got the opportunity to make a dish from there own particular favorite chef personality. The dish I chose was one I adapted from Giada De Laurentiis’ cookbook “Giada’s Family Dinners”. It’s a wonderful zippy appetizer that would be a welcome addition to any holiday gathering!!! This recipe is quick and easy to whip together and what makes it perfect for a holiday party (other than the zippy taste and crunch) is that you can make the aioli a few days in advance and store it in the fridge until you’re ready to serve. Perfect for the harried hostess! 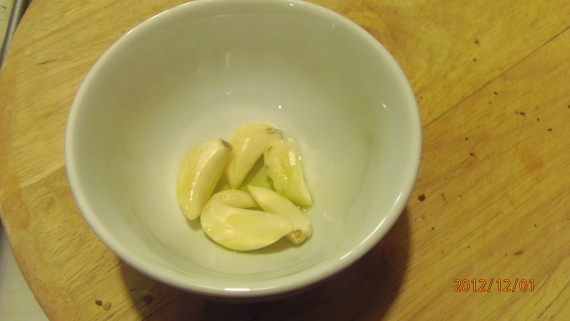 -To make the aioli place the garlic cloves in a microwave safe dish with the olive oil and microwave on low power until the garlic is soft and pliable (watch it carefully as this will not take long). 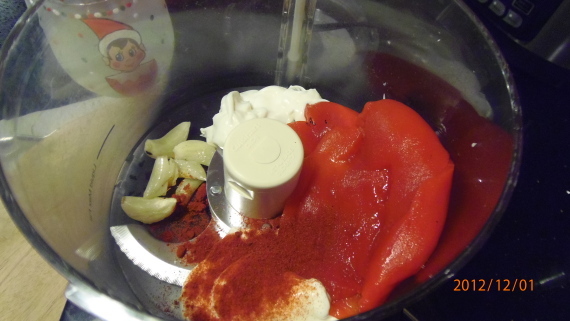 -In a food processor, add the cooked garlic, dried peppers, mayonnaise, smoked paprika and the sugar. -Pulse just until the mixture comes together and is creamy, but not overly processed. 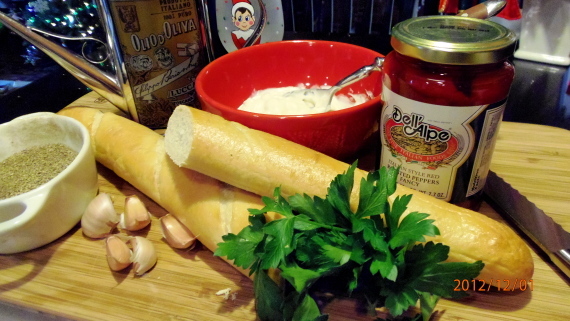 -Place in a small bowl, cover and refrigerate until ready to serve with the garlic toasts. 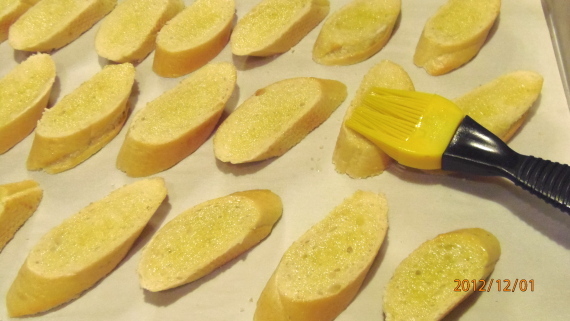 -To make the toasts, brush each slice with a little olive oil. -Sprinkle each slice with a little salt and pepper. 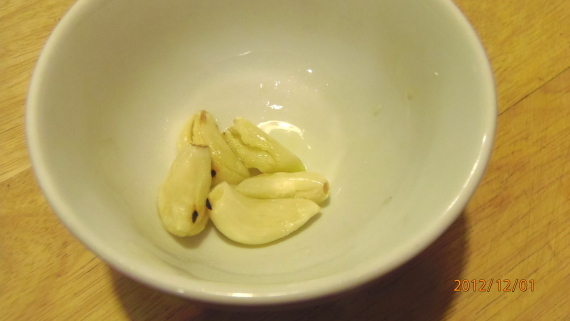 -Remove from the oven and as soon as they’re cool enough to handle, rub a cut garlic clove over each slice of toast. Mmmmm. 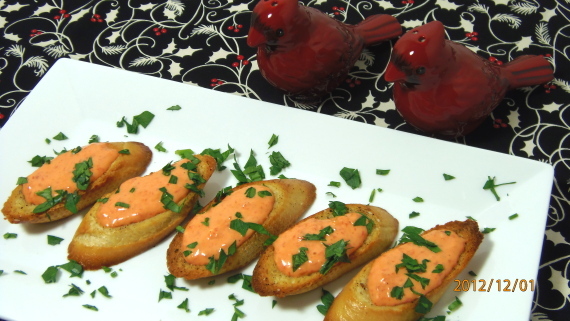 -To serve, spread the red pepper aioli onto the garlic toasts and garnish with some fresh chopped parsley. Well, there you have it, my first recipe submission for #SundaySupper and it couldn’t have come at a better time than the for all your holiday entertaining! For more fabulous celebrity chef inspired recipes, check out all the other wonderful lip smackin’ good recipes and blogs listed below. weekly #SundaySupper live chat. All you have to do is follow the #SundaySupper hashtag or you can follow us through TweetChat. I hope you’ll come back soon. You’re always welcome in my Kudos Kitchen!!! Welcome to the family! Your toasts looks delicious! We like Giada here too! Thanks Pam! It's nice to be here. Can't wait to see everyone's celebrity dishes and meet some new food blogger friends! I am sure you figured it all out perfectly! These look lovely. Oh YUM! This would definitely be a great appetizer to serve up at a get together…I want some of this!!! Great job Renee! I really like Giada's recipes and this one is no exception. I refer to her cookbooks at least once a week for quick weeknight dinners. Thanks for sharing! My kind of appetizer! It would go wonderfully with a glass of wine and perhaps a side of cheese. Welcome to #SundaySupper. What a lovely looking appetizer. Giada is one of our favorites and we call her my husband's girlfriend. He has a crush!! Thanks for sharing on #SundaySupper. Looks wonderful! So flavorful, and great for a party. Welcome to #SundaySupper! So glad to have you join #SundaySupper! And don't be nervous – we don't bite 🙂 You won't find a nicer bunch of foodies anywhere. 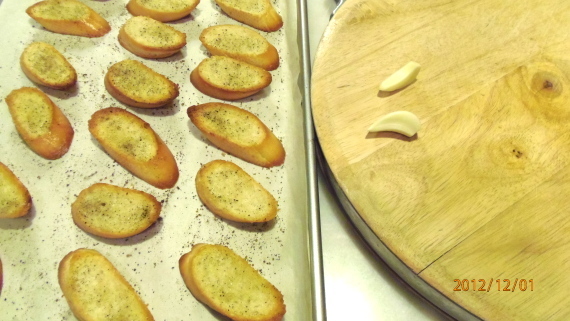 Your garlic toasts look like a perfect appetizer. Thanks for sharing! Hi Renee!!! 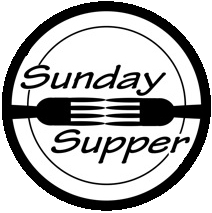 Welcome aboard, #SundaySupper is one of the things I love the most about the blogging world. I love knowing I share a passion with so many others! You've done a fantastic job, it gets easier and you'll be a pro in no time! I love Giada too, she's one of my favorites because, well she just makes everything look so easy, you can really see her passion when she cooks for her family. What a fabulous appetizer for any party! Love how you can make it ahead of time!! Welcome!! Welcome! Love these little toasts, and I bet the aioli would have so many uses. I think these would be tasty with my Giada-inspired #SundaySupper. Simple & yummy ! Love this 🙂 ! Oh my. I don't normally like mayonnaise but this looks so good I just have to try it. Welcome to Sunday Supper! 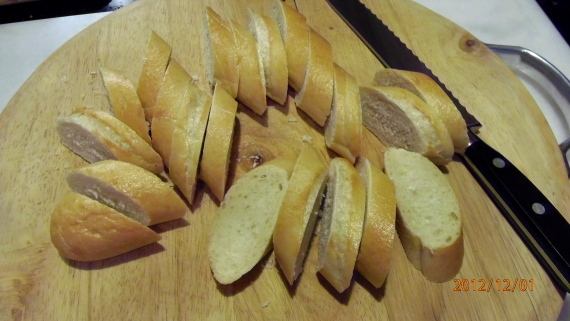 Anything shmeared on bread has my name all over it! YUM! Bread and aioli, it could be my downfall! And since I never tried a flavored aioli I´m surely pinning this one. Welcome to the group! 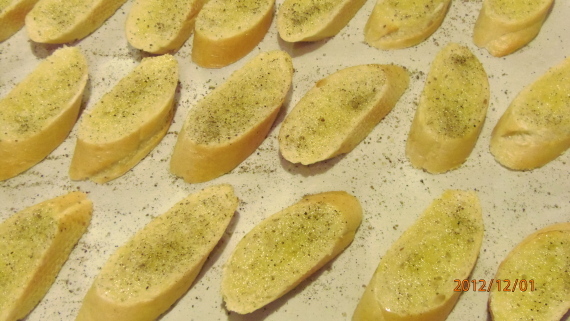 Renee, mmmmm your garlic toast looks amazing! I LOVE Giada. . can't wait to try this!! And welcome to the Sunday Supper family! you will love it! Great post! Yummy! Love this recipe. I can see myself with a glass of bubbly noshing on these tasty treats! 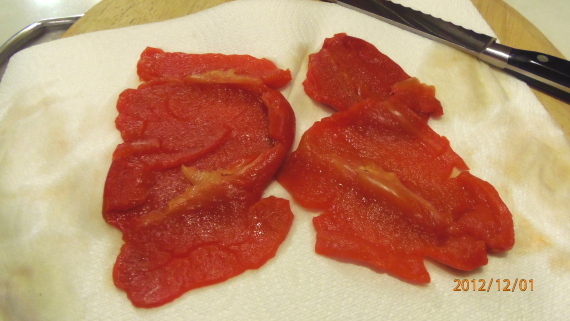 Roasted red pepper is one of my favorite indredients of all time. I love Giada's recipes. Once I saw a stuffed crab shells that she made and I had to go make it right away. They were divine. Welcome to #SundaySupper Renee. We are so happy to have you. You did great for your first event! These look great! It is funny, as a kid I hated all things pepper. Now I love them more and more! I am so honored that you joined us Around the Family Table for #SundaySupper Renee! Beautiful recipe!!!!! This is really a lovely appetizer Renee and you are right, perfect timing with the holiday party season coming up. I see a little elf in the background there…did you paint it? Welcome to #SundaySupper, Renee! You're in great company! The red pepper aioli looks delicious!! !